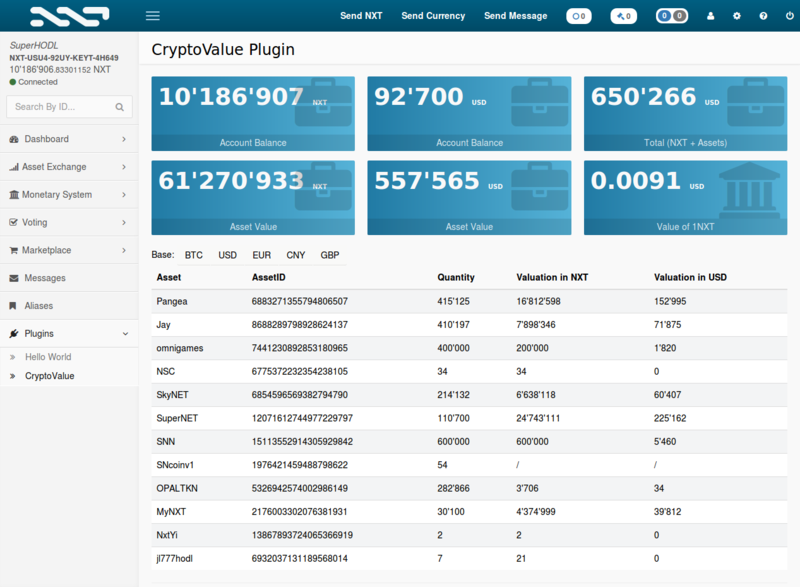 CryptoValue Plugin fetches current market data and displays current Value of your NXT holdings and Asset Values based on latest bid on AE. This can be further improved in next Versions. Current Version lets you see your NAV in BTC,USD,EUR,CNY or GBP. It will cost 150NXT and i hope it will be available on nxtplugins.com. Part of the Earnings will be donated to xchrix. Looks good! I'll buy it when it is on nxtplugins. Its now available on Marketplace! See OP. When will this be on nxtplugins.com? If anyone wants a refund pls contact me via PM on nxtforum or post in this thread. Im on Linux and it worked for me. Sorry about that but as I said I dont have time for now. I might try disabling all other plugins when I get time. See if another plugin is interfering. If that doesn't work I'm at a loss as to what the problem is. Edit: Tried with only 1 plugin and still the same. I disabled all plugins and nothing changed, I also tried with the "Browser Web Ubuntu" but doesn't work either. It seems an issue with Ubuntu rather than the browser.